With two spooky ghost movies in theaters this weekend, The Innkeepers and Daniel Radcliffe's The Woman in Black, it's only right to pay homage to the great ghost movies from the past. 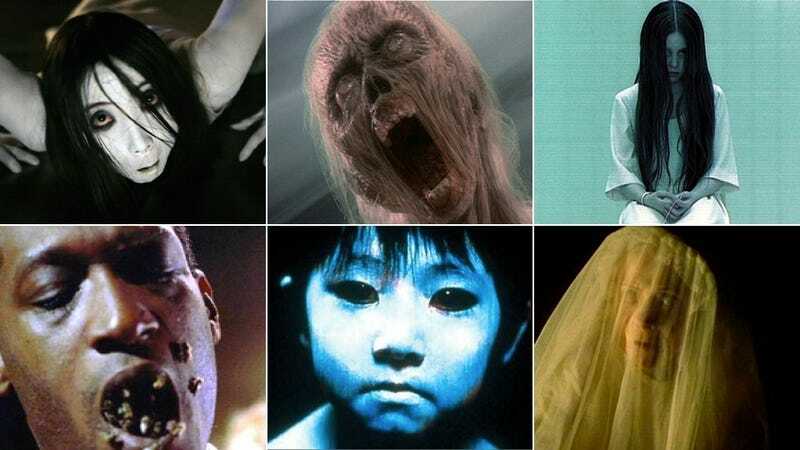 So here is our list of the very best spooks and hauntings to ever grace the silver screen. This twisty take on a traditional haunting gives the audience a ghost-eye's view. Plenty of smoke and mirrors and frightening momento mori photographs culminate in one odd supernatural tale. A doomed romance and bloody murder haunts the people of Chicago's Cabrini Green. Should you call his name three times in the mirror, the Candyman will appear and gut you with his bloody bee-hook. The remake of the 1979 hoax was actually pretty chilling in some places, especially when you allow your Native American-hating ghosts to posses the chiseled body of Ryan Reynolds. Laughably stupid in many parts, this remake got it right by having all the ghosts of the mental ward move at lightning pace. Both films are equally terrifying. As they should be, as the 2004 horror flick was a remake of Takashi Shimizu's horror flick. But as I could not find an embeddable clip from the original, they are both getting a shout out. The never-ending parade of jump scares turned this family's astral projection problem into an all-night ghost hotel. Watch this mysterious horse suicide tape and the ghost of the evil child Samara will appear from the well she was condemned to die in. As for you, you'll transform into a dehydrated, dead yogi. "You sonofabitch, you left the bodies! You only moved the headstones. You only moved the headstones!" Using very little camera trickery and just good old-fashioned thumping, the residents of this mansion got an unexpected visit from the previous owner looking to hide his murderous past...and possibly take a new wife. Both heartwarming and chilling, the undead beings that haunted a wee Haley Joel Osment kept you on the edge of your seat, especially when they were pissed off. They often were. Harrison Ford and Michelle Pfeiffer are plagued by a lady ghost with an axe to grind. There are few things scarier than listening to the ghostly pleas from spirit children in J.A. Bayona's supernatural flick. When a family's 16-year-old daughter drowns, their grief is eclipsed by the presumed haunting of their dead family member. After hiring a psychic and parapsychologist, the family discovers their daughter lead a double life. If you liked the The Others, you'll love The Innocents. Also inspired by the novella The Turn of the Screw director Jack Clayton used light and freaky ghost dances to push the viewer over the edge. Almost didn't make the list after many "Does it really have ghosts?" arguments. Stanley Kubrick drives Jack Nicholson insane when he unleashes horny furries on the writer's poor psyche. While they're not the scariest ghost movies of all time, we wanted to add these two hilarious, iconic, and sometimes spooky movies, simply because they're just that great. Possibly the most underrated ghost movie of all time. Peter O`Toole, Daryl Hannah, Liam Nesson, and Steve Guttenberg join together to make a hilarious and often quite frightening tale about a down-and-out ancient hotel that tries to drum up business by faking a haunting. Naturally, the real ghosts of the manor are none too pleased with this. Equal parts horror and comedy, this gang of spiritual exterminators used their proton packs to rid the world of horrifically frightening librarians.